Jara (Horacio Camandule) works as a night security guard in a Montevideo supermarket and moonlights on weekends as a bouncer in a bar that needs one. He's got the right physical attributes for his line, but inside he's like a shy, gentle nine-year-old, so instead of chatting up an attractive coworker (Leonor Svarcas), he tracks her and her mop up and down the aisles via closed-circuit TV. Then he progresses to shadowing her everywhere she goes after work—but writer-director Adrián Biniez barely flirts with the possibility that there's a dark side to his stalking behavior. It's an interesting film but not enthralling, a little like Steven Soderbergh's Bubble minus the element of crime. In Spanish with subtitles. 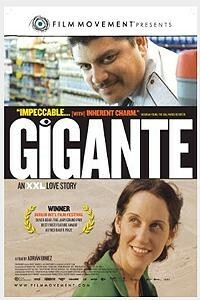 Gigante is not showing in any theaters in the area.